With assistance from Millersville University graduate students an assessment was completed to calculate the amount of stormwater coming off the home and make recommendations for specific solutions (location, size, and scale). With some quick re-routing of downspouts the property owners were able to take nearly 100% of the roof run-off from the home to the front of the house where a dry well and rain garden were installed by Living Stone Landscapes a City of Lancaster based contractor. 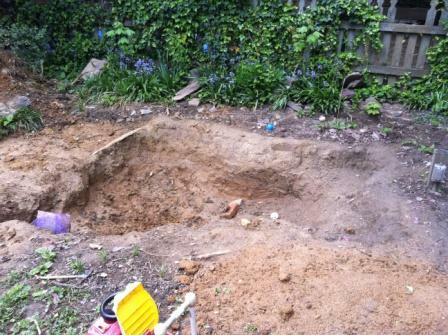 The Dry well is excavated, lined with geo textile and overflow pipe. Clean stone fills the well and is wrapped in the geo textile keeping soil and sediment out but allowing water to flow in. 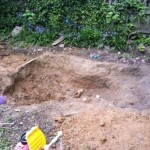 The well is covered with 1′ of soil and planted. Each dry well is scaled in size based on the amount of water that flows in. 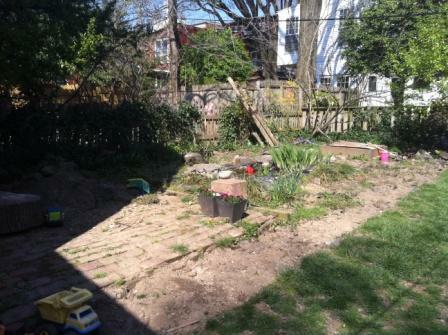 The rain garden (pictured above and below), also known as bioretention, is a method of managing stormwater by pooling water within a planting area, using soil burms that allow the water to infiltrate into the garden. The native plants and flowers were selected for their many benefits to wildlife and were installed by Lancaster County Conservancy staff and volunteers. 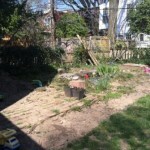 It’s really not that hard to transform your garden into a welcoming habitat for native wildlife. Pollinators are bees, butterflies, hummingbirds and other animals which feed from flowers, transferring pollen in the process. Many blooming plants depend on pollinators for survival, and globally many pollinators are showing disturbing signs of decline from a variety of causes. A first of its kind, in Lancaster City, public demonstration project to show local residents how the use of simple technologies such as rain barrels, a rain garden and dry creek can be used in combination to capture and retain water flow from homes, capturing nutrients and reducing flow to the City’s Combined Sewer System. Rain Barrels – 2 barrels at 55 gallon capacity for each barrel: Rain barrels were installed onsite with overflow into a large rain garden. Rain Garden (Size 12’ x 20’): The location of the rain garden will address runoff from the garage roof (See Wolf Museum Rain Garden Proposal above). The rain garden was installed at least 10’ from neighbors’ garage foundation in line with the downspout and slope to intercept the rooftop water. From our onsite observation increasing the depth (18-20″) and using a mixture of 40% topsoil from the site, 40% sand, and 20% compost will ensure there is more than sufficient infiltration in the rain garden. Dry Creek: The Conservancy recommended that the runoff coming from Downspout B, 131 gallons, be directed into a dry creek to slow the runoff through the garden area. The dry creek was dug to approximately 10″ deep, 12″ wide and 35′ long to allow for slow infiltration. The dry creek design will minimize erosion from the discharge pipe and provide another method to slowly infiltrate rain water while adding an interesting feature in the landscape. Images from July 2014, 3 months after the installation. New and existing plants are thriving. Moving to Lancaster city in 2003, Michael Clapper and Amelia Rauser were thrilled to find a home property with a large yard. However, it was not long before the couple realized large rainstorms combined with an urban, impervious environment could pose a threat to their home, stormwater flooded their basement and they began to search for a solution. The couple reasoned that “rain should soak into the earth”, but instead North Mary and West Orange Streets transform into “rivers” during wet weather events. Michael and Amelia decided they needed a method of collecting rainwater that would prevent excessive runoff and allow the water sufficient time to infiltrate the ground. The couple creatively predicted that by digging “a big hole in the ground” the rainwater would have a place to pool “until it can soak into the earth”. The plan sounded rational and reasonable to achieve; however, the couple’s self-constructed reservoir, filled with gravel, did not prove effective in halting the stormwater from entering their basement. 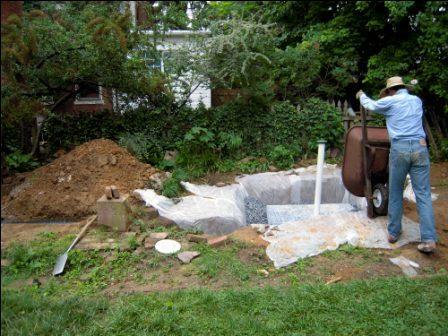 Remembering the work of the Lancaster County Conservancy’s Urban Greening program, Michael and Amelia contacted Fritz Schroeder, who suggested a dry well as a potentially effective solution to their dilemma. The project fit closely with the couple’s previous plan, but added a green infrastructure technique. 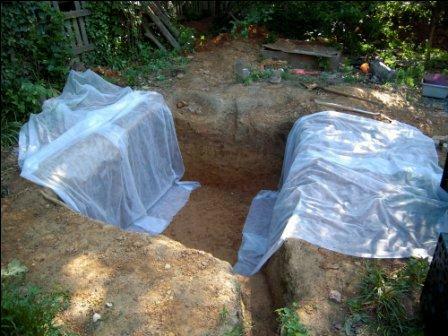 Amelia and Michael set out to remove an old pond and expanded that space to create a reservoir, measuring 5.5 X 6.5 X 3.5 feet deep and filled the space with a stormwater storage module – think plastic milk crate – (97% void) and 6 tons of gravel (40% void) to maximize their volume capture. The downspout that runs from the rear of the home captures approximately 1000 square feet, and a one inch rain storm yields approximately 550 gallons of water. Accounting for the possibility of extreme storms of more than one inch, Amelia inserted a PVC pipe drilled with holes into the gravel and stormwater storage module, which would allow excess water to come above ground and flow through the yard. The couple stated the project was “fairly simple” to complete themselves; however, it became “more technical” as it progressed and “required 5 days of vigorous labor”. Amelia commented that it would have been helpful if there had been “role models” to follow, “people we could have asked for advice”, it can be a “cheap project if you are willing to do the work”. Note: An application such as a drywell or rain garden should be more than 10 feet from the foundation of your home, preferably downhill. Always perform and infiltration test to insure your area can handle the amount of rain water you plan to capture. Google stormwater storage module to learn more about this product. 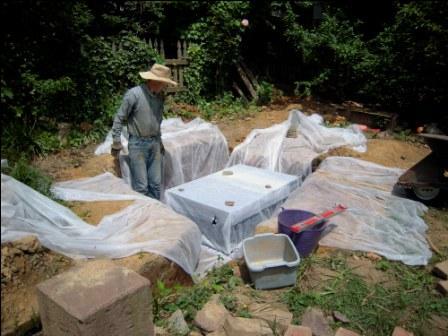 For more information about implementing similar practices please review the Infiltration Practices Fact Sheet (PDF) or contact Fritz Schroeder with the Lancaster County Conservancy, 717-392-7891 x 207.